The betting markets for CFB tournaments are primarily influenced by the perceptions of the team quality and aggregating power ratings and so you have the scope of getting an edge into it if you penetrate a bit deeper in this business studying the weakness and strength of the teams. It is not uncommon in such sport to locate games which have been priced between a TD or field goal where a particular team has the clear winning advantage which it likely to utilize for an easy victory. You will be exploit considerable opportunities to predict accurate outcome of the matches simply following the certain basic norms of football rather than focusing on the generalized perceptions. Our firm usually focuses on the offensive attack of each team before the actual task of bringing the appropriate methodologies for accurate prediction. Here our professional handicappers mainly emphasized on the strength and areas of concerns for such teams. It is quite essential to comprehend whether these teams are focusing on attacking through passing game or rushing game to beat the opponents in a competitive tournament. Not only their strategies but also their styles must be thoroughly observed for these parameters come quite handy for predicting the outcomes of such college level game. If you have good rapport with the varsity coaches there is the chance for you to obtain all the team related information which can provide a supporting tool for predicting the prospect of every team just on the eve of the matches. Our handicappers also studies the statistical records of each varsity team besides obtaining private information of every team and combine all these findings to suggest appropriate betting amount size for the clients. Teams that have performed superbly in previous year may not able to repeat the same this year because if the team players have completed their graduation and left the colleges. Then to bet on the new players of such team it is essential to have a proper study on their playing style to provide correct feedbacks to the clients. We also study their movement with the ball to gauge their success or failure in the tournament in case there is no raw data available for such estimation. Now if you want to predict results on the basis of solid defense of each team it is essential to have the statistical records of previous year. Then you have to assess the impact of the change of coaches that might influence the performance of the players of every team in the current season of the tournament. Our firm in such scenario obtains the help of the support staffs of every team to have an insight into the psychology of the players under the charge of the new coaches or assistant coaches. If our findings show that the attitude of the players is positive under the new coach then it can be said that the team has a good chance in this year’s college tournament and if we find the some of the teams are dissatisfied with their new coaches then we predict dismal performance from such team in the tournament. Then comes the turnover factor where it becomes difficult to predict if the team strength is similar. But we can quite easily predict so following the team combination. If the teams are packed with inexperienced quarterbacks then there is an increased possibility of higher turnovers. If any team is playing away match we can easily predict that its turnover would be quite higher compared to the home team. Besides team members playing on the position of third down commit more turnovers than players directly attack the ball. Unlike other firms we never discourage our clients that turnovers are basically random. Simply observing such minute features we can easily predict the teams with high turnover possibility. You can follow this tactics of ours so that you never fall into the hands of wrong handicappers who would try to influence you to place bets on other factors except this. You must also be smart with the power ratings of the teams when determining their possibility in the tournament. You should not be tempted by the power ratings of the fraud handicappers for they might lure you to invest heavily and suffer considerable losses. To check the reliability of such ratings you can avail the services of our firm and our experts mainly apply the other team related factors in determining the actual power ratings of every college football team. But for college football games power ratings often do not come into consideration as in the case of high profile club footballs. · Multi-dimensional offenses that can exploit any weakness. · Quarterbacks having inexperience vs. Strong pass defenses. 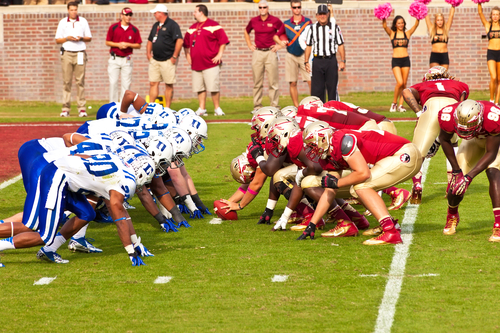 · Soft running opponents vs. strong rushing teams. · Turnover prone opponents vs. strong passing teams. These criteria would not only help you in accurate prediction but also provide you surplus profits in the long run if you invest on small betting amounts. To know more about college football handicapping you can log on to our website or can visit our head office anytime. You can also learn the handicapping tricks from our expert handicappers to have an edge in this competitive market. Our sole priority is your satisfaction and without your support our service quality will remain incomplete and void. We always try to improvise our service and so we do not monitor the performance of other firms.